Chromebooks may be budget-priced, but that doesn't mean you should have to endure cut-rate performance. Here are five simple ways to boost your Chromebook's capabilities without breaking the bank. The Chromebook's limited internal hard drive fills up fast, but there's plenty of room for your data on the internet. Every Chromebook comes bundled with 100 GB of cloud storage space; just head over to https://drive.google.com/redeem to activate the expansion. But why limit yourself to just one cloud? Dropbox, Box, and iCloud all offer Chrome OS apps through the Google Web Store as well and offer free storage options. The Chrome OS may not be able to run conventional standalone programs, but there's an app for that. That is, while you won't be able to use programs like Photoshop, Skype, or iTunes, Google offers a number of capable alternatives, many of which come pre-installed. And if you find any of these Google-branded apps to be lacking, the Web Store has a wide variety of superior third party offerings including the PIXLR image editor, Feedly, Evernote, and Pocket. The Chromebook keyboard uses a condensed layout that can take some getting used to, but ultimately proves quite efficient. Instead of the conventional function (F1 - F12) keys running along the top row, you'll find a series of hot keys that allow you to quickly cycle through your browsing history, reload active webpages, switch between open windows, and adjust both the sound and screen brightness levels. And instead of the dedicated Page Up/Down or Home/End keys you'd find on a standard full-size board, Chromebooks use Ctrl+Alt+arrow keys to navigate within the page. You can find a comprehensive list of available shortcuts here—just be sure to bookmark the page (Ctrl+D) until you have them memorized. Or, if you prefer to make your own shortcuts, the Shortcut Manager extension allows you to assign custom keyboard shortcuts to virtually any Chromebook process. If you prefer to use a full size keyboard or separate mouse instead, you can simply connect one via wired USB or Bluetooth connection. To activate the Bluetooth connectivity, click the lower right corner of the desktop (where the battery status icon resides) to open the settings submenu, click Enable Bluetooth, and follow the onscreen instructions to pair the devices. Wireless BT headphones, mics, and speakers can also be connected in this manner. Trying to print from a Chromebook can be an adventure seeing as how you can't actually plug the printer directly to it. Instead you've got to use Google's Cloud Print service to connect wirelessly to either a Cloud-enabled printer or a conventional one that's wired to an Internet-connected PC or Mac. The installation process for Cloud printers differs by manufacturer, though Google offers instructions for each of the major brands here. If you're using a wired printer, on the other hand, you'll have to first install Chrome on the computer that it's connected to, then select Add Printers from the browser's Advanced Settings menu (it's found in the three-line icon in the upper right corner of the window). Aside from the Pixel's HD gloriousness, most Chromebook displays are closer to good than great. But instead of squinting, why not hook up a desktop monitor? How you do so depends on the model of Chromebook you have. Pixels, for example, are equipped with an HDMI port to connect directly with HD monitors. The HP Chromebook 11, on the other hand, only sports a Slimline port and therefore requires a separately-sold HDMI-Slimport adapter. Be warned however, unless you are running port to port without conversion (i.e. HDMI to HDMI), the resolution will suffer. You might even consider picking up a Chromecast instead and mirroring your display onto a big screen TV. Once you've got the wiring figured out, open the Settings menu and click the Display Settings radio button. On that menu, select which monitor (or monitors) you want to use, then adjust their orientations if necessary, and set it to either directly mirror or act as an extension of the desktop. 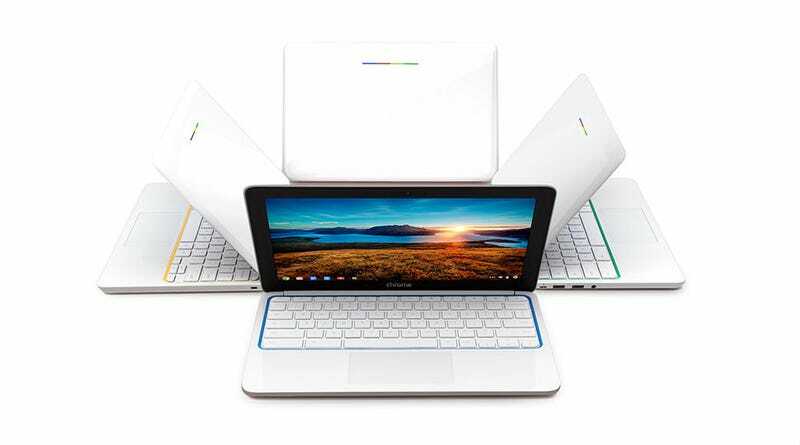 These are just a few methods of bolstering the Chromebook's performance. If you know of a handy Chromebook hack, let us know in the discussion below.